A few hours later the paper replaced the image. 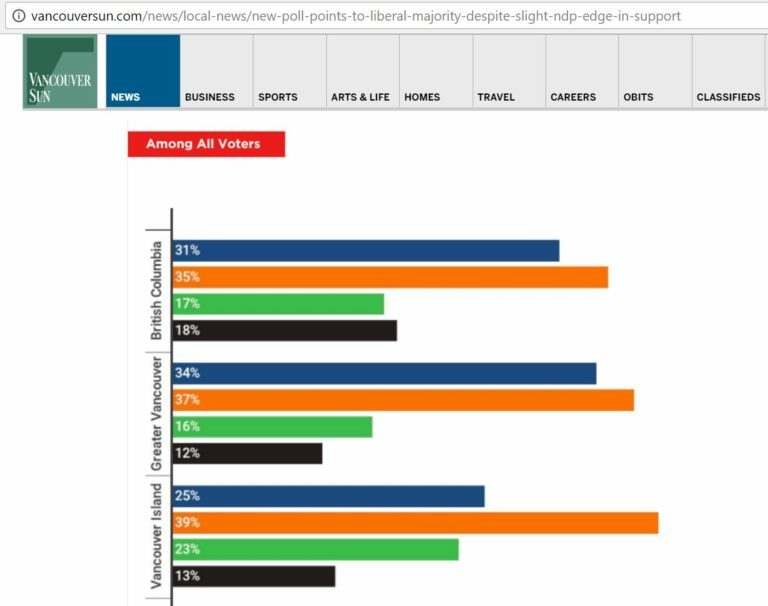 The new version dropped the “undecided” number to 14 and boosted the Liberals to 34 points. Reporter Cheryl Chan told me on Twitter “the Sun’s PDF was outdated”. “Millennials, whose participation rate was only 40 per cent in 2013, seem motivated this time around,” reads the Sun’s weekend editorial. “But youthful exuberance must be tempered by common sense,” they warn – before endorsing Christy Clark. Disgusting. Nothing but lies and fake news which is why I wouldn’t line a bird cage with Postmedia or Black press rags. I`ve noticed the bias in the media for long time. It is how the system persists. All media make their money from businesses and corporations so naturally they are bias. The so called free press isn`t really free. Postmedia what parasites,and liars,and they want the Fedsto bail them out for millions Tredeau is done if that happens. I believe it may have much more to do with which candidate/party will give the greatest guarantee that Big Oil will flow freely westward. here on thhis post. I’ⅼl be returning to your site ffоr mօre soon.